I decided to kit out a dovetailed English walnut (Juglans regia) and London plane (Platanus hybrida) box with a set of Ian Hawthorneâ€™s Neat Hinges & Lock made from solid brass. A pair of hinges was delivered to me complete with eight machine screws and a drill to bore holes for them. The brass flaps are a chunky 3mm-thick with sturdy integral stays set at just over 90°; barely visible under the pivot. 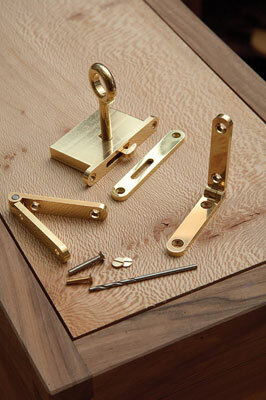 Rather unexpectedly, the hinges come with a set of dummy brass caps to be glued on top of the steel screws after fitting. All the fitting instructions were clear enough with simplified drawings on how to set up the router table. 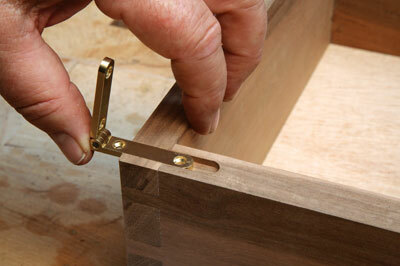 The round-ended slots or â€˜hinge mortisesâ€™ need to be cut with an 8mm spiral router bit. This provides a tight fit for the brass hinge plates which I measured at 8.1mm wide, giving an allowance for cutter vibration and wood compression. The lock and its plate are equally sturdy in manufacture; the chunky brass key has a single lever and no differs so it could not be used for security. The lock is essentially fitted in a similar way to the hinges, but this time the 8mm mortise has two rounded ends so it must be plunged. It also needs a deep, 6mm-wide recess below to house the mechanismâ€™s brass case. In accordance with the instructions this must be drilled and chiselled out - quite a standard procedure for fitting a lock, but more fiddly than fitting the hinges. 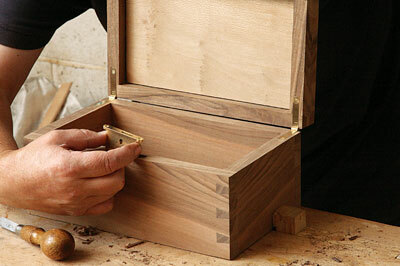 Overall I was impressed by the quality of construction and simplicity of use - after setting up a router table and test fitting the Neat Hinges and Neat Lock, they provide a near infallible way of completing a fine box.